Purchased this stroller after my little one grew out of her baby stroller. My two year old's head sits against the shade so she has to slide down if i want to open/close the shade... She is not a 'BIG' kid, the specs of this stroller is off.. Seat should've been a big bigger so kids and sit easy! We purchased this travel system for our newborn who was born a few months ago. The car seat is great, however, the stroller is very poor. We ordered two sets before trying them out (what a mistake!). The fitment of the wheels is terrible and they rub against the plastic brake piece which is annoying. In addition, the wheels are not balanced at all so there is a very noticeable wobble in the wheel. The fitment with the axle is very poor. I've tried reassembling multiple times without any improvement. This is the case with both strollers. I suspect this is a poor design and not just a limited defect since it's happening with both strollers. It is awkward to unlatch and unfold the stroller. Also can be difficult trying to align the seat to snap in. I absolutely love this stroller! It is so easy to use. Easy to fold up and put in the car. I love that I can turn my son to face me or face out. Plenty of storage underneath in the basket. Just a great stroller all around! Well worse the price! Love graco travel system. Bought per a friend's recommendation. Made a right decision. I bought this for my baby, and is been a great !!! Love it. Perfect size, fit everything, durable, good quality. I go a lot to Disneyland and fits all of my baby items. Once it's folded up it won't stay upright because of the front wheel. It has to either lay flat or be propped up between other things. You can't just lean it against the wall. Plus it takes up a ton of room in the car trunk. Very frustrating and inconvenient. It won't even fit in our Honda. I bought this for my soon to be granddaughter. Both my son and daughter-in-law love the look and ease of operation of both the stroller and car seat. They can't wait until September to use them both! I really wished I looked at other strollers before getting this one. I have had it for 6 months and it began squeaking and creaking at about 2 months of use. The handle also isn't on tight and wobbles when pushing and some times its hard clicking the carseat into the frame. No tools need which was nice. Bought it early the boy comes in September I have not used so details unavailable. Loved it, not so much anymore. We received this stroller for our first baby and I agree that it has some pros and cons. It's super convienent with the bucket seat, lots of storage and nice sized basket underneath. The problem is that by the 9th month of use, the wheels started to squeak horribly and it became harder to steer. Now I know that it's not a jogging stroller, so it's not meant for rough terrain, but I was having issues with the wheels getting stuck going across a short patch of grass and now the front wheels are getting stuck on simple floor. Because of this it's much harder to steer and feels quite heavy. I also found the one hand fold not as simple as it would seem. I loved loved loved this stroller system at first and unfortunately now it's more of an annoyance. I bought this 3 years ago for first child. No issues.Only problem is heavy, but it's strong. we through stroller on back of trunk, we took stroller to Florida to Hawaii and back. I'm pretty sure people through our stroller on airplane too. We have been traveled a lot with this stroller.Infant seat, we used everyday for more than year for both children.I mean it's been leaky pooped, snacks, juice, you name it, washed dry go back next day. We through infant seat on the floor, being kicked etc. (without baby in it, lol).We bought double stroller and notice now this stroller's storage is big.I through diaper bags, while shopping I through products under, hang hangers on handles, I close the shade and put shopping basket on top... It's being through a lot, and survived perfectly fine. If we have third child, I'm pretty sure it will survive again. I bought this 3 years ago for first child. No issues. Only problem is heavy, but it's strong. we through stroller on back of trunk, we took stroller to Florida to Hawaii and back. I'm pretty sure people through our stroller on airplane too. We have been traveled a lot with this stroller. Infant seat, we used everyday for more than year for both children. I mean it's been leaky pooped, snacks, juice, you name it, washed dry go back next day. We through infant seat on the floor, being kicked etc. (without baby in it, lol). We bought double stroller and notice now this stroller's storage is big. It's being through a lot, and survived perfectly fine. If we have third child, I'm pretty sure it will survive again. I had the bottom piece that clicks on fall down and drag all the time. We also have issues with the tires. They get stuck adt times without warning. So not satisfied with 4 months of use. 1st 2 month seemed fine. I bought this a couple of years ago for my daughter. I loved the versatility and the different riding options. It is fairly lightweight, and easy to maneuver. After my child was no longer riding in the car-seat that snaps into this system, she rode in the regular part of the stroller. I CANNOT for the life of me understand why any company makes something that you cannot take pieces off to clean! I did not realize this when purchasing, and now know it after she grew out of her baby car seat and began riding in the stroller itself. Nothing that a baby/toddler every sits in should be "spot clean." Absolutely ridiculous. My child is far from destructive and overly messy, but simple stains from a bottle falling, sippy cup falling, a small piece of food here and there. I couldn't imagine if a child had a "blow out" in this stroller!" You would be hosing it out and possibly getting rid of it! For how much money this stroller costs, all parts should be able to be cleaned! Not just the car-seat! I bought this a couple of years ago for my daughter. I loved the versatility and the different riding options. It is fairly lightweight, and easy to maneuver. After my child was no longer riding in the car-seat that snaps into this system, she rode in the regular part of the stroller. I CANNOT for the life of me understand why any company makes something that you cannot take pieces off to clean! I did not realize this when purchasing, and now know it after she grew out of her baby car seat and began riding in the stroller itself. Nothing that a baby/toddler every sits in should be "spot clean." Absolutely ridiculous. My child is far from destructive and overly messy, but simple stains from a bottle falling, sippy cup falling, a small piece of food here and there. I couldn't imagine if a child had a "blow out" in this stroller!" You would be hosing it out and possibly getting rid of it! For how much money this stroller costs, all parts should be able to be cleaned! Not just the car-seat! This is the coolest stroller set ever. I like that you can remove the toddler seat and it becomes a super compact stroller for easy travel. It's also cool that you can face the car seat forward or backward. Having a 4th baby after a long pause. An unexpected arrival so we already gave old Graco car seat to someone. Obviously, our first choice was Graco. We opted for a jogger style because the wheels are big. Its faster and convenient off road and good for malls and walkways as well. Baby is expected in July but we bought now because we got a good price. Kids were excited to open, assemble and see. We all our so happy on the purchase. It's sturdy, elegant and compact. Assembling and disassembling is quick and easy. Car seat is much lighter compared to the previous model. Definitely, we will enjoy and the baby will be comfortable and happy in this. After the car seat age, it will be used as a stroller. We also like the black/yellow/gold (unisex) color. Model # 1969645. We would recommend to others and grandparents were also happy to see the quality purchase. I enjoy the versatility of it, lightweight and style but the quality is not great for what you paid for. The wheels are squeaky and rust easily, has a flimsy feel to it when pushing and maneuvering it. The structures coating scratches easily causing it to look rough quickly. Terrible in snow and grass basically anything other than cement. Wish i had taken more time to shop around before purchasing. I bought this Stroller/carseat in July 2016 for my first child. I wanted to buy a stroller/car seat I knew would last a long time. My son is 15 months and still is using it. I have nothing but good things to say about this stroller/carseat... totally worth it!!!! My granddaughter is only 7 months old and 18 lbs and has outgrown the car seat. It says it's good up to 35 lbs, not true!! I am now looking for another car seat. Stroller is a dream and easy to use. Love the stroller!! I have it since september and its awesome. I have really enjoin this travel system. I bought this stroller in Sept , I love how versatile it is very convenient. You can just click on the car seat to stroller frame so easily or the actual stroller. The only problem I have is I have squeaky tire or tires! Idk why it's brand new .. I bought this stroller in Sept , I love how versatile it is very convenient. You can just click on the car seat to stroller frame so easily or the actual stroller. The only problem I have is I have squeaky tire or tires! I'dk why it's brand new ..
Would love this stroller, however, it does squeak. It's obnoxious and embarrassing. Haven't even had it a year. I make all attempts to avoid using the stroller so i don't have to hear it. I love this stroller ! I purchase this stroller 4 years ago and use it regularly! It's holding up well . It's so versatile and useful . 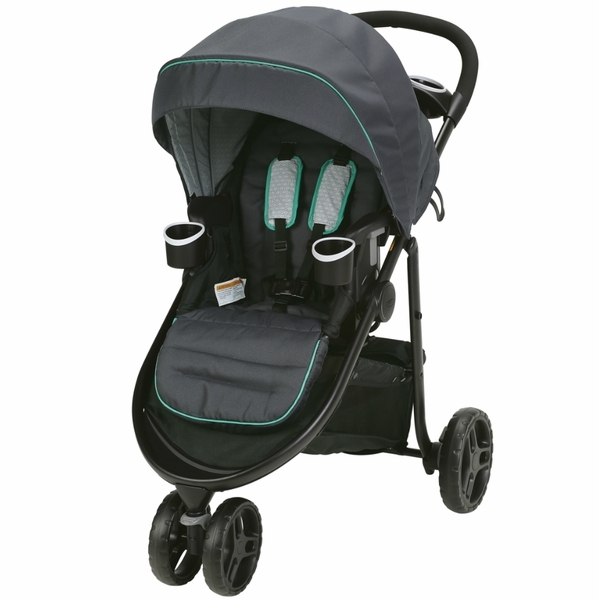 It's a full size stroller it's a bit bulky when folded other than that I love all the features ! I received this for my baby shower , loved it at first but now the wheels are constantly squeaking because it's made of plastic... can be pretty embarrassing at times!! 've had this stroller for 4-5 months and it seems like it has become more and more difficult for me to open it. I often feel embarrassed when i get it out of the car and struggle with it for 5 or so minutes trying to open it from fold. I am not sure if the release is broken or just gets struck but it is frustrating, especially since the benefit of the stroller is to grow with my child and it is already broken. I received the travel system as a gift at my shower. My son is 6 months old and it is very loud. the side of the stroller makes so much noise when in use, it sounds like it is years old. This was not a cheap stroller, disappointed. What do we do about the squeaking front wheel? There's a few reviews mentioning how the front wheel starts to squeak after a few months of use. My system is now squeaking as well. Is there a solution for this problem? I bought this stroller back in February right before my son was born. We have been using the stroller for 6 months with no problems and now the front tire makes a squeaking noise when using it. It's not loud but does get annoying. This has been an awesome stroller. Baby likes it, I like it, folds in my car great. The only problem is the front wheel squeek. It's so high pitched I hate using it in quite places. I was very impressed by the Modes LX stroller & carseat. As soon as I took it out of the box, I could see from the quality that Graco had put a lot of time and research into improving upon their previous models. The feel of the materials in the car seat were very fine - what I would expect from a much higher priced carseat. The part that shades the baby from the sun is made of a stretchy, jersey like material that protects but still allows air through so they will stay cool. The inside is soft and comfortable. And it was easy to adjust the straps to fit my 3 month old snuggly and securely. Next, I took the stroller out of the box. The instructions for putting it together were overall, simple. However, I was stumped by the first instruction which didn't seem to clearly point to an arm that is on only ONE side of the stroller. That arm can be pulled back to release the stroller. It is used to open the stroller easily when it's in the closed position. The snaps were a little tough to fasten, but I think that's actually good, because that means they won't come apart easily. Again, the frame of the stroller is very sturdy, but somehow very lightweight. It's a smooth ride with the 4 wheels (2 larger ones in the back, and 2 smaller on the front). I put my 19 month old son into the stroller and he loved it! It's very easy to adjust the foot rest for a different height of child. The same goes for adjusting the recline of the seat. You can even lift the footrest up when you recline the seat, so it looks like a bed! And when your child wants to sit upright again, then can just pull themselves up and the seat will automatically click back into the upright position. I thought that was brilliant! Less for mommy & daddy to do. The quality of both the click connect car seat and the stroller are much better than you'd expect for this price point. And the car seat can click into 3 different positions inside of the stroller. So basically, I can use this for my infant and for my toddler (one at a time, of course). The storage area underneath is definitely an improvement, as it's large, but slightly slanted, so it's easy to get to and remove items. I'd highly recommend this stroller to any parent looking for both quality, value, and style. *I received this product for free in exchange for my honest review. 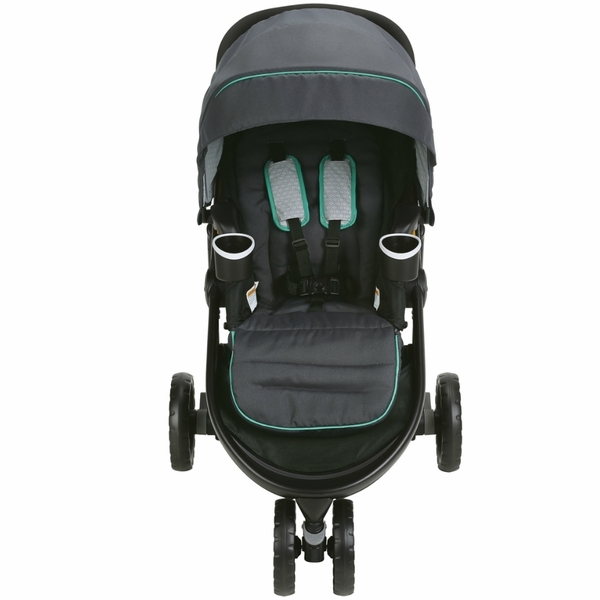 I was very impressed by the Modes LX stroller & carseat. As soon as I took it out of the box, I could see from the quality that Graco had put a lot of time and research into improving upon their previous models. The feel of the materials in the car seat were very fine - what I would expect from a much higher priced carseat. The part that shades the baby from the sun is made of a stretchy, jersey like material that protects but still allows air through so they will stay cool. The inside is soft and comfortable. And it was easy to adjust the straps to fit my 3 month old snuggly and securely. Next, I took the stroller out of the box. The instructions for putting it together were overall, simple. However, I was stumped by the first instruction which didn't seem to clearly point to an arm that is on only ONE side of the stroller. That arm can be pulled back to release the stroller. It is used to open the stroller easily when it's in the closed position. The snaps were a little tough to fasten, but I think that's actually good, because that means they won't come apart easily. Again, the frame of the stroller is very sturdy, but somehow very lightweight. It's a smooth ride with the 4 wheels (2 larger ones in the back, and 2 smaller on the front). I put my 19 month old son into the stroller and he loved it! It's very easy to adjust the foot rest for a different height of child. The same goes for adjusting the recline of the seat. You can even lift the footrest up when you recline the seat, so it looks like a bed! And when your child wants to sit upright again, then can just pull themselves up and the seat will automatically click back into the upright position. I thought that was brilliant! Less for mommy & daddy to do. The quality of both the click connect car seat and the stroller are much better than you'd expect for this price point. And the car seat can click into 3 different positions inside of the stroller. So basically, I can use this for my infant and for my toddler (one at a time, of course). 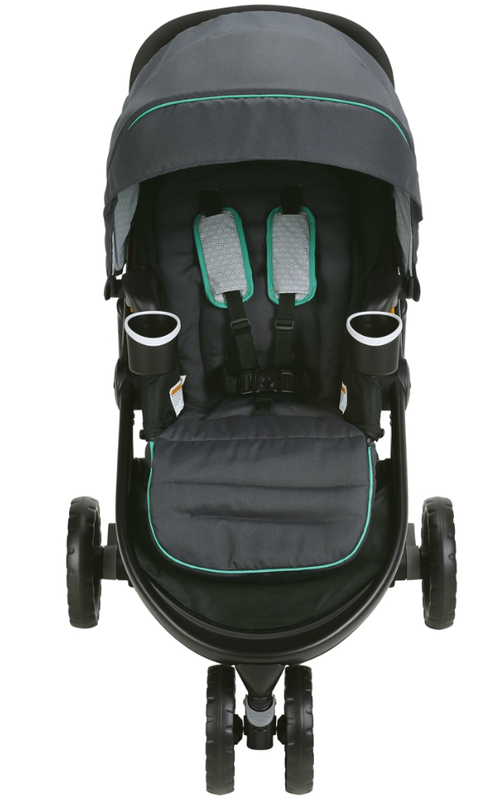 The storage area underneath is definitely an improvement, as it's large, but slightly slanted, so it's easy to get to and remove items.I'd highly recommend this stroller to any parent looking for both quality, value, and style. *I received this product for free in exchange for my honest review. 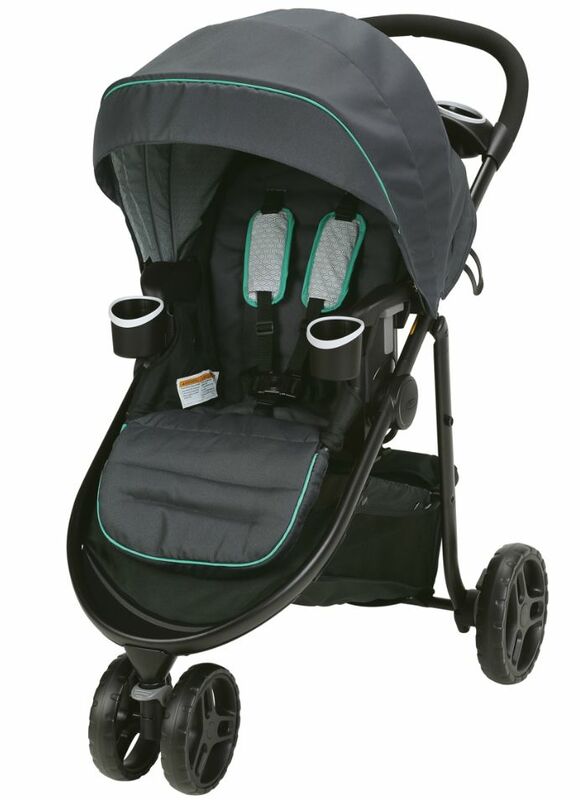 I received this product for free in exchange for my honest review and I have been using this stroller for a bit now and an loving all the different ways it can be used. The baby carseat is easy in and out and then the bassinet when not using the carseat is so wonderful for a sleeping baby to lay flat. It's secure and looks really comfortable. I love how my baby can face forward or face me and that its very easy to switch between the two. I really love the different positioning for the stroller handle. It can be positioned for my tall husband or myself who is 5'2. Overall a great product! I don't know where to begin! lol First of all, it was super easy to put all the parts together. We had it all set up in less than 15mins. Also, I love how versatile this is! I really like that you can take out the toddler seat and just use the baby carrier. It just makes it all less bulky. Also, I really like how light weight it is. I tested many different brands and other models as well at the store and they all seemed so bulky and heavy which was a big turn off for me. Our baby will be here in a few weeks and I can't wait to start using it! With our third child on the way, we purchased this stroller to replace our old stroller (also a Graco, just 7 years old and worn!). While I have not used it with an infant carrier, I have been testing it out with my toddler. He loves it! Folding and lifting is not too bad. The weight should be okay for me to handle post-partum. I love that you can just use the baby carrier and the frame. It is definitely lighter that way.One of the biggest improvements I've noticed between our old and new is the steering is smoother and the seat is much sturdier. I love how it fully reclines flat. (This will really come in handy when needing to do a baby diaper change when a table may not be available.) Reading other reviews, I noted that the big negative was squeaky wheels. When we first put the stroller together, it was fine. However, the next day while hauling a toddler, purse, and shopping bags, a terrible squeak developed. It was very annoying! My husband just removed the back wheels and added a little grease... problem solved. Maybe Graco should include a little grease packet to apply when assembling? I am so excited to use this with our new baby! We bought this for our first child and were able to use it for our second as well. The car seat is light weight and easily clicks into and out of the car seat base and the stroller. We found the base very easy to set up in our cars, it has a level display so that you know the incline is correct. I've had to wash the car seat fabric a couple times, thanks to blow outs. I am shocked how easy it was to remove from the car seat and how nicely it washes. The only issue I am currently having is that with my second child, the straps are hard to tighten. I think there is an issue with the tighten strap area changing alignment, because I've noticed it is chewing the strap. The stroller is amazing and the best I've tested. It is so easy to maneuver. It feels very light to push. The storage underneath is HUGE. It can easily fold up with one hand, but I do need two in order to open it. The cup holders and snack trays are a nice added benefit. This stroller is also easy when changing positions and only take a matter of a few seconds to switch from forward facing to backward facing. When I first bought this stroller, I was absolutely in love with it. We used if for a few months and never had any issues. However, after we took it to the beach for the first time and walked it on the sand, the front wheel began to squeak. At first, it was no big deal because we would just grease it up and it would stop. However, at this point, I have to grease the wheel every single time I want to use it. I am so so so disappointed and I don't understand why this issue has not been corrected. I have seen quite a few reviews with the exact same complaint. At this point, I don't even use it anymore. With our third child on the way, we purchased this stroller to replace our old stroller (also a Graco, just 7 years old and worn!). While I have not used it with an infant carrier, I have been testing it out with my toddler. He loves it! Folding and lifting is not too bad. The weight should be okay for me to handle post-partum. I love that you can just use the baby carrier and the frame. It is definitely lighter that way. One of the biggest improvements I've noticed between our old and new is the steering is smoother and the seat is much sturdier. I love how it fully reclines flat. (This will really come in handy when needing to do a baby diaper change when a table may not be available.) Reading other reviews, I noted that the big negative was squeaky wheels. When we first put the stroller together, it was fine. However, the next day while hauling a toddler, purse, and shopping bags, a terrible squeak developed. It was very annoying! My husband just removed the back wheels and added a little grease... problem solved. Maybe Graco should include a little grease packet to apply when assembling? I am so excited to use this with our new baby! We bought this for our first child and were able to use it for our second as well. The car seat is light weight and easily clicks into and out of the car seat base and the stroller. We found the base very easy to set up in our cars, it has a level display so that you know the incline is correct. I've had to wash the car seat fabric a couple times, thanks to blow outs. I am shocked how easy it was to remove from the car seat and how nicely it washes. The only issue I am currently having is that with my second child, the straps are hard to tighten. I think there is an issue with the tighten strap area changing alignment, because I've noticed it is chewing the strap. The stroller is amazing and the best I've tested. It is so easy to maneuver. It feels very light to push. The storage underneath is HUGE. It can easily fold up with one hand, but I do need two in order to open it. The cup holders and snack trays are a nice added benefit. This stroller is also easy when changing positions and only take a matter of a few seconds to switch from forward facing to backward facing. I received this system for free for an honest review of the product. I absolutely loved the features of this travel system, I wish I had it with my older daughter. Being able to take out the seat and use it as a car seat carrier rather than just putting it into the stroller was awesome. It helped to keep the weight of the system down and the ease of use was amazing. Its so sleek looking and I am so happy to be able to use this with my son for a long time! Love the Stroller, Hate the Squeak! I bought this a couple months ago before my due date, I tried it out at the store and fell in love! My baby is now 12 days old and we finally assembled and used the stroller for the first time, I'm disappointed in the squeaky noise! It was really embarrassing to walk around with something that sounded like it was old and falling apart. I spent a lot of money on what I thought was a amazing strolle because I will be needing to use the stroller a lot, yet I'm not pleased with the product. As a second-time mom I was excited to try the Graco Modes Click Connect Travel System. The stroller is lightweight which is appreciated when many moms are used to/tired of lugging around heavy car seats and struggling to collapse a stroller (also pretty simple). I really enjoy the versatility of being able to face the carseat towards you or away with the click of the button. The basket storage is pretty large and holds coats, shopping bags and my backpack diaper bag with ease. I love that the system comes with the cup/cell phone holder accessories unlike other brands where everything is a la carte. While the stroller does have a fairly smooth ride, I'm a big fan of rubber wheels and wish that the Modes had them. I've only had the product for a few weeks and the plastic tires are still in good condition but it does not glide like the other stroller I've had for three years. You can still steer with one hand decently well.Note: I received this product for free in exchange for my honest review. As a second-time mom I was excited to try the Graco Modes Click Connect Travel System. The stroller is lightweight which is appreciated when many moms are used to/tired of lugging around heavy car seats and struggling to collapse a stroller (also pretty simple). I really enjoy the versatility of being able to face the carseat towards you or away with the click of the button. The basket storage is pretty large and holds coats, shopping bags and my backpack diaper bag with ease. I love that the system comes with the cup/cell phone holder accessories unlike other brands where everything is a la carte. While the stroller does have a fairly smooth ride, I'm a big fan of rubber wheels and wish that the Modes had them. I've only had the product for a few weeks and the plastic tires are still in good condition but it does not glide like the other stroller I've had for three years. You can still steer with one hand decently well. Note: I received this product for free in exchange for my honest review. I got this stroller for my baby a few months ago and I love it.But now am try to find a traveling bag for it but don't know where to find one. Can you guys tell me where can I buy one. My son is 5 months old. I enjoy the size and convince of this stroller but since he was about 2 months old the front wheel makes a high pitch squeaking noise. I no longer can use it in public due to the embarrassing noise. Not sure I will be purchasing more Graco products in the future. Very disappointed. The Graco Modes 3 Lite Stroller gives you five ways to ride on a sporty 3-wheel frame plus our signature FastAction, one-second fold. Five ways to ride includes infant car seat on frame facing parent or the world, stroller seat on frame facing parent or the world, or traditional travel system. Innovative fold design lets you fold two ways to store the stroller with or without the toddler seat. The lightweight, sturdy baby stroller frame makes it convenient to take on-the-go and makes quick, and long, trips with baby easier!